When you make the decision to elope or have a super intimate destination wedding, you’re cutting out so so so many of the decisions you would’ve had to make if you were having a wedding. You no longer have to worry about guest favors, valet service for your slew of guests, ceremony programs, venues to house 200 guests, bridesmaids dresses, reception decor & details, seating charts, and many other things you would have needed had you hosted a wedding. However, one thing that will remain the same is the fact that you might want a bouquet. The oh so good news is that there are talented florists everywhere you go, so no matter where you want to elope, there will be options! If you need recommendations based on your elopement location, I’d love to help! Additionally, most florists actually WANT to travel for destination weddings or elopements, so don’t fret if there’s a florist you love from California if you’re eloping in Utah. Just reach out to them and ask- you never know what could happen! 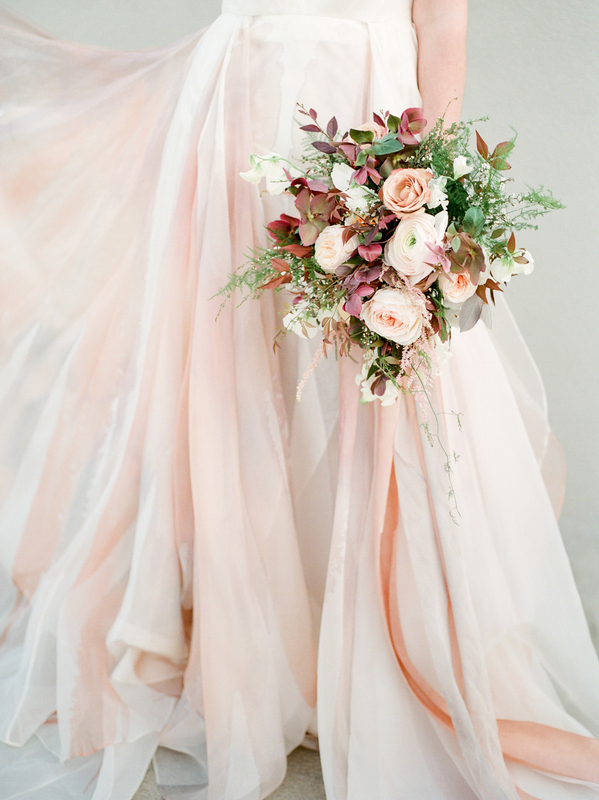 Below are three elopement bouquet ideas that you may not have thought of! If you hire a skilled florist, your bouquet will not look like the silk flower aisle in Hobby Lobby! Now, hear me out. If the logistics of your elopement or intimate destination wedding doesn’t allow for a florist to deliver a fresh bouquet composed of fussy blooms on the day of (if you happen to be in a remote location like Marfa, Texas or Iceland or somewhere like that) a dried bouquet or silk bouquet (or a combination of the two, as pictured in the first photo below) might be a good fit for you! Additionally, if you’re ok with a bouquet made of the local greenery, textures, field grasses, or other local elements, you might consider trusting your florist to forage for your bouquet. I love a good ribbon, especially if you’re headed to a destination spot with beautiful views and a little breeze to make that ribbon dance in the wind. Some of my favorite ribbon companies are Silk & Willow, FrouFrou Chic, Poetry of Silk, and Tono + Co. Your florist might already have some of these luxurious brands on hand to adorn your bouquet, but if they don’t you can provide your own. If you’re an adventurous couple making the trek to a mountaintop to say your vows, or if you plan on doing plenty of exploring on your wedding day to take lots of portraits, a smaller bouquet can aid in the process of a smoother day. Big + fluffy bouquets, while beautiful, are heavy and take up more room.